Aiming at Shodan -- The Art of Making your Previous Stones Work Effectively (額 謙 の有段をめざす二つのポイント―前に打った石を働かせるコツISBN4-480-87705-3) by Gaku Yuzuru, Chikumashobo Publisher(1997), 222 pages. Play moves that make your previously placed stones work as effectively as possible (even if some of those previous plays were inaccurate). Brilliant tesujis may be exhilarating, he says, but unless they are in the service of that rule, they cannot be expected to yield good results -- they may just be postponing defeat. In concrete terms, he explains, "working effectively" concerns fighting and territory and their interrelation. For example, a strong, thick position *must* be used for fighting; to the extent that it is not so used, it is wasted. Conversely, it is futile to pick fights in an area where your opponent is very strong. Also, one must understand where it is efficient to build territory -- in particular, don't set out to build it in a zone where either you or your opponent have a strong fighting stance; but do force (or allow) your opponent to wall off territory inefficiently, while you do something better. No player near shodan strength, Gaku says, would disagree with such statements as abstract principles. But successfully applying them in the heat of a game is something else. Developing the judgement and ability to apply them consistently in actual games, he says, would propel a player into upper-dan levels. The book begins with a 48 page introductory chapter in which the eight common bad habits treated in the previous book are briefly reviewed, and in which preliminary examples of both effective and ineffective play, as regards both fighting and territory-formation, are explored. Following this are the three main chapters. Chapter I (36 pages) is entitled "Where to make territory and where to get your opponent to make territory." Chapter II (52 pages) is entitled "Influence and power are for fighting!" Chapter III (80 pages) presents twenty "Spot the error" problems. The first two chapters are built around extracts from sixteen amateur games, eight per chapter, in which the players (dan-level and up) repeatedly fail to make effective use of their existing configurations. Each extract begins at some critical juncture, not too far into the game, where a major mistake has just been made. 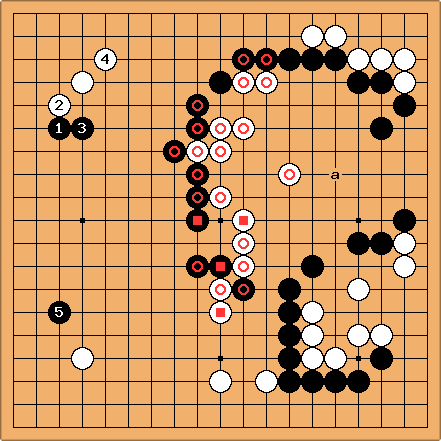 Gaku explains how one of his principles has been violated and how the opponent could have taken advantage (but usually never does); then he shows what moves were actually demanded by the position, along with with several plausible continuations. Following this, he returns to the game as actually played and identifies the next major mistake, some moves later, and repeats the whole process, sometimes running through several iterations before moving on to the next game. His purpose, always, is to show how to get the best out of positions that actually evolve in amateur games, even if some previous moves were mistakes. Also, the point of elaborating on the errors is not just to make the correct moves look better, but to alert us to common blind spots; and punishing an opponent's error is another aspect of effective use of existing stones. In Chapter III he supplies additional positions from actual games, with discussion, which could have been included in the preceding two chapters; but he prefers to present them as problems, to give the reader a chance to test his new understanding. Each problem displays a position together with the next several moves, ranging in number from two to five but sometimes as many as eight or nine. Among those moves there is guaranteed to be a major error by one side or the other, of a sort typical of dan-level play; and the reader is asked to identify and correct it in light of the preceding chapters. However I can attest that it is all too easy to focus on small issues and miss the major flaw that becomes obvious once it is pointed out. 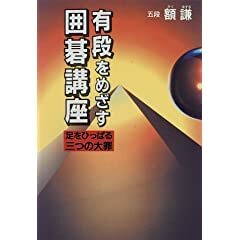 My misjudgements are consistent with one of Gaku's repeated criticisms of bad moves, throughout the book: that the erring player is "responding to the sound of the opponent's stone" instead of looking hard at the needs of the position. This book should appeal to readers within a few stones of dan level in strength, and higher. Here are some positions considered by Gaku, along with condensed incomplete summaries of some of the analysis. "Please make territory on the upper side." In response to , Black has played to obstruct W from making territory at the top. But this is precisely wrong: B has placed his lone stone near W thickness, in W's strong fighting area. So after , whichever defensive move B elects to make, a or b, W will play the other, thereby engulfing B on one side or the other. By playing White is playing in his own fighting area instead of saving it for a fight. So following that move B's attitude should be, as Gaku puts it, "please let me help you make territory on the upper side!" Playing at a, for instance, and then after playing at c, would show "excellent judgement of how to face W's strength." Another possibility would be to play as a cap at 3. This is good if it is played with the intention of compressing W from the outside, not jumping in to start a fight. 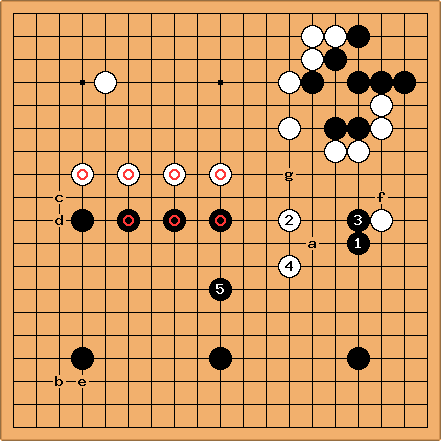 Returning to the game as actually played, Gaku shows that following at a and at b, Black might try to break out with a forcing move at e and a contact move against . Actually, this line of play is very tricky, and several variations are supplied showing both accurate and inaccurate defense. But Gaku is emphatic that even if they sometimes succeed, such moves on B's part are vulgar overplays and he should still play as discussed above. This position is from a game between high dan players. The marked stones have just been played one by one, starting with White. Gaku remarks that when the board is partitioned like this into two big moyos, the middle game becomes very difficult. Following , Black may have hoped for at 3; following that, a B jump to a would give him a "magnificent" position. But his high dan opponent plays and instead. However: in the position as played, Black has missed another chance, for two good moves! 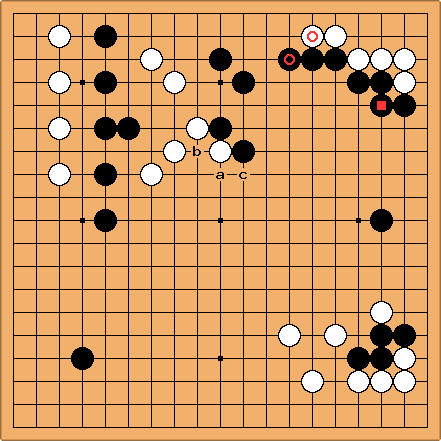 Following , playing at f would have made perfect use of the previously played and to control the W stone. And it is sente: after W responds at g (to stave off a Black play there), Black could come back to close the corner at e, which would still be bigger than enclosing at 5. So , as played, was doubly an error. A 1 kyu is playing at 3 stones against a 2 dan. W has just invaded under the upper right handicap stone with a standard outcome, except that because of a slight inversion of move order by W, the last two stones played were and . B has actually made two joseki errors, one relatively minor but the other serious enough to toss away an easy win in exchange for an uphill battle. The minor error is the solid connection of instead of the usual hanging connection. The major error is -- the final joseki move ! Because of the existing stones a few spaces over, B is already so solid without that if W were to hane from followed by a cut, he could not break in, and could at worst indent B by a few points. But in the actual game, following , W immediately plays at c. While B responds with defensive moves to protect his big area, W leans against those defensive moves moves while simultaneously developing shape and thickness for his middle group. Then he turns on B's stringy group on the left which has become vulnerable; and it is now W who does the chasing and will probably either kill B, or make territory on the bottom while threatening to ooze into the right. Gaku calls a "typical amateur safety operation error." From a dan level game. The position begins with none of the marked stones, except for to the right of tengen. W plays the lower to reinforce the upper one, a move which Gaku characterizes as both dangerous and foolish, in light of Black's "extraordinarily strong" position. Black "cleverly" caps with the lower , the visible crosscut comes into being, isolating the upper , and then B plays to confine W inside the moyo. Gaku discusses how W lives, pointing out that B still has significant threats against the group, starting with Ba which also makes some territory. But having lived, W now thinks that at least he has wrecked a potentially giant B territory, and that B has gained little from his originally strong position. However, this is an illusion: because of the newly created outer thickness B is "guaranteed" to get a large territory on the left, if he knows how; and the key is to start with . The beginning of one such sequence is shown here. W could try some tricky resistance, but B is so strong that all-out attacking moves on his part will succeed against anything that W tries. Gaku discusses a few possibilities and warns against pifalls for B. Chief among these is playing too close to his own strength instead of pressing W against it, if the occasion arises. As for W's initial move, instead of reinforcing from below it should have been an escape at the upper , moving out directly to the left. There are various possibilities for what could follow, but W would have gotten a much better result than in the actual game. Aiming at Shodan -- Three Faults That Hold You Back.